Loveall News! : Happy Birthday Mom (aka Granny)! Happy Birthday Mom (aka Granny)! I just wanted to wish my Mom a VERY Happy Birthday! I wish I was in FL to celebrate it with you, Mom! I hope your bithday weekend is special and that you are treated like a Queen! Love you and see you soon! 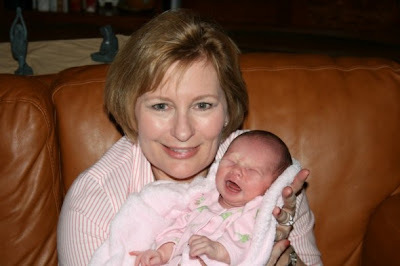 Granny & Grace (I love this picture becuase my Mom looks so happy and Grace is not...the true life of a Granny). Happy Birthday! Your mom still looks as beautiful and as young as ever! And, yes, she does look so happy in her role as Granny.